There are currently no promotions. Stay tuned for our next contest. I. 1 point for every comment you leave on SGG. II. 2 points for any and every in depth review you leave on SGG through the comments box. Any strains you may have tried that haven't been review can be left as a comment on the "Reviews & Awards" page. Any review of Portal Botanical's products will earn an additional +1 point. III. 2 points for liking SGG's Facebook Page. The Facebook page is accessible at http://www.facebook.com/secretgardenguide. IV. 2 points for every comment you leave on our Facebook Page. V. 1 point for every like on one of our Facebook Posts. VI. 2 point for following our Twitter page (https://twitter.com/klatosgarden). I. 1 point for every $10 worth of products you purchase from Portal Botanical (rounded down, excludes shipping). Forward receipt(s) to secretgardenguide@gmail.com as proof of the purchase. II. 3 points if the review posted as described in item III of section I. Points earned run concurrent with Item III, Section 1. 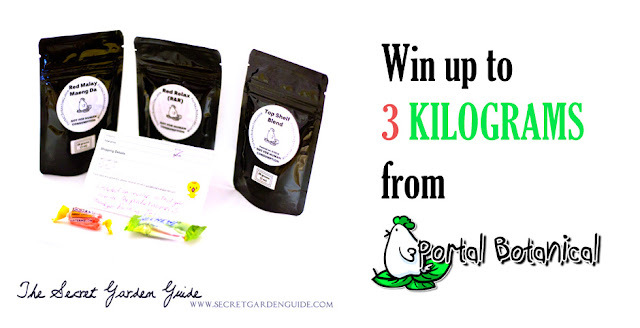 At any moment you may e-mail secretgardenguide@gmail.com to receive a count of your total points. This contest is intended to help promote the growth of The Secret Garden Guide's community, as well as the customer base of our contest sponsor Portal Botanical. Spam or unconditionally inflammatory comments, reviews and approaches will not be counted toward your total points--violations will result in disqualification from the contest. Good luck everyone! We sincerely hope you continue to appreciate our reviews and contribution of unbiased information to the Kratom community. A huge thanks to Portal Kratom for supporting this contest. *This contests ends on May 31st, 2016 (one month from our one year anniversary). Any and all questions can be directed to secretgardenguide@gmail.com or posted in the comments section. Naturally, all entries are subject to your location's legal status. If kratom is illegal in your state (or any applicable level), unfortunately you cannot participate. Sorry, we know it's not fair :/. This contest, and those which will follow are designed to provide kratom consumers with opportunities to win free products while simultaneously building upon the community as a whole, bringing us closer together. The name you use to post (cannot be anonymous) will be entered into the raffle. Email a screenshot and URL to secretgardenguide@gmail.com for verification. This link MUST NOT be considered spamming by any conservative standards, and must stay up until the end of the contest. 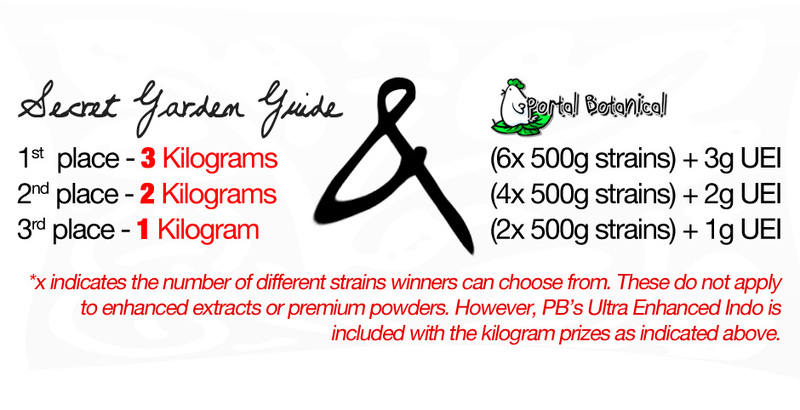 On January 31st, 2016 all cyber tickets will be input into an applet which will generate a random selection for winner... who gets a full kilo of kratom! THE MORE CYBER TICKETS YOU HAVE, THE GREATER YOUR CHANCES OF WINNING. 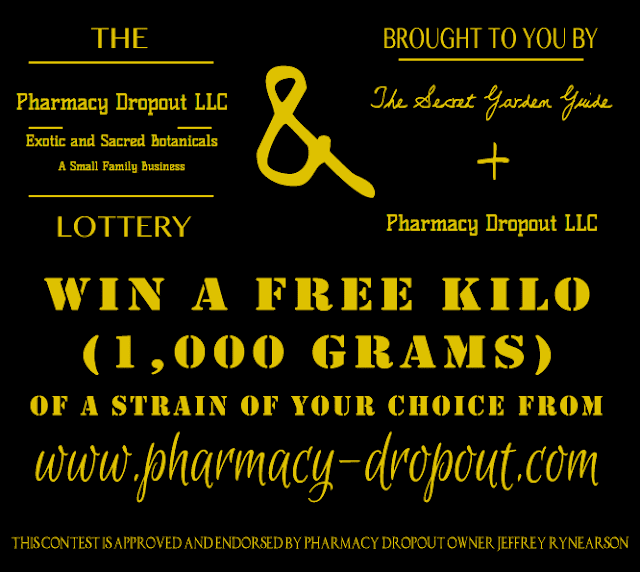 Be sure to visit www.pharmacy-dropout.com to see their fantastic selection of quality kratom products. Then dream about which strain you'd like a free kilo of... perhaps your dreams will come true :). Stay tuned for any updates, we may add additional means of acquiring cyber tickets! Make use of the comment box for any questions regarding the contest. :D does this count as a cyber ticket? Yay! Where do I order? Please keep discussions appropriate and on topic. We do not condone abuse of any of these products and will not allow any posts which implicate such use. Kratom is NOT for human consumption and any mention of this will be unpublished and deleted. Keep it safe, responsible, positive, and keep the love going. Place your link here. Email secretgardenguide@gmail.com for more info.